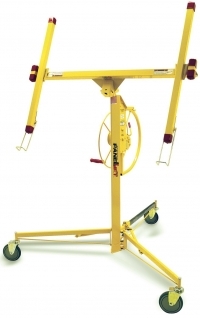 The chain drive technologies, used for years in our professional drywall lifts, are now coupled with a manual winch and torque limiter. The Model 439 will reach heights of 14 feet 5 inches and still load at the height of just 35 inches. This means that you will no longer need extensions to reach 95% of the lids. If you need to go higher you can add the model 154 (18 inch) extension to reach almost 16 feet; making the Panellift® Model 439 the highest reaching lift in the industry. The heavy-duty chains mean that you will never have to replace cable sheaves or cables again. Damaged lifts from overloading are a thing of the past. The two-way overload preventing torque limiter keeps you and the 439 safe and able to work for years to come.